As the mobility experts that we are, Orthopedic Service Company works with only the highest safety and quality standards to bring customers the top brands and products available in the market. 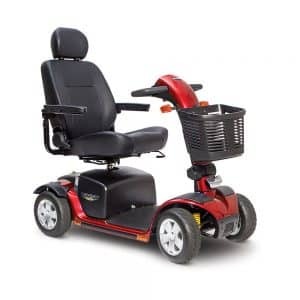 With this in mind, Pride Mobility Products perfectly fits into our portfolio of brands due to the great innovation and modern technologies incorporated into their design and development process. We proudly present the scooter Pride Victory Sport as part of our catalogue. As a mobility vehicle, the scooter Pride Victory Sport creates a truly unique ride experience with extra comfort and maximum speed to fit those who are most accustomed to an active lifestyle. A scooter to accelerate your everyday life, the scooter Pride Victory Sport drives up to 8 mph and provides great stability with supreme comfort for the user to experience a ride that actually fits their active lifestyle. Its feather touch disassembly allows for easy disassemblement into 5 lightweight pieces facilitating transport. Its 10” solid tires, front and rear suspension and high back reclining seat make it ideal for outdoor use. Due to our great quality of service and wide range of top of the market products available, customers confide in us. Visit our showroom or give us a call today so our mobility experts can guide you in seeing if the scooter Pride Victory Sport is the perfect ride for you.